Everyone can experience brain fog from time to time, especially when they have been exhausted or overwhelmed. This makes you feel foggy and incapable of really functioning in the way you normally do. Whatever the reason for the foggy feeling, it’s always a bit stressful to experience it. 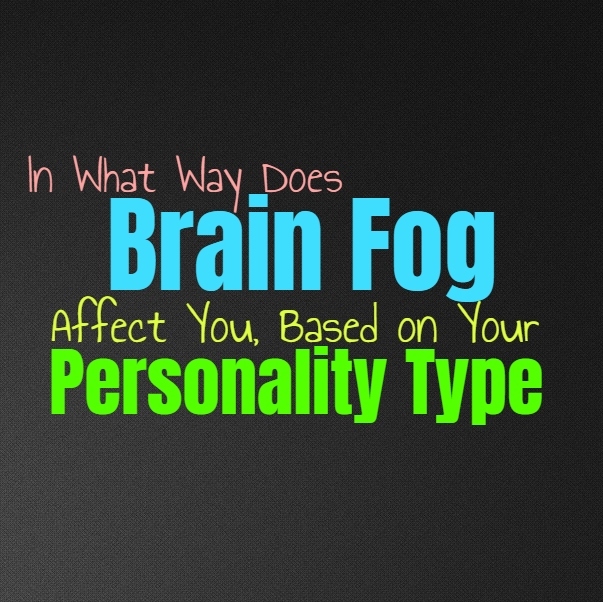 Here is how brain fog affects you, based on your personality type. When the INFJ experiences brain fog it can make them feel overwhelmed, like they are failing or unintelligent. They are hard on themselves and so when their natural wit and quick minds aren’t capable of keeping up like usual, it leaves them feeling very frustrated. The INFJ often blames themselves when this happens, They don’t like feeling as if they aren’t capable of processing information quickly, and become truly annoyed with themselves. They might not recognize that they need sleep or some sort of physical need which can make their brain fog a bit worse, and their frustration towards it even more difficult. ENFJs really don’t handle experiencing brain fog well at all, and often find themselves more anxious about the situation. They don’t like feeling like their wit or mental strength isn’t completely within their control, especially since ENFJs often have so many things they need to focus on. They become frustrated with themselves when they feel brain fog, especially when there is something important they need to focus on. The ENFJ will likely try their best to push through this, and it can be even more draining for them. They might become a bit edgy and short-tempered, especially since they are pushing past mental exhaustion. INFPs spend a lot of time inside of their own minds, so when they are feeling a bit foggy it definitely makes them want to retreat more. The INFP will want to find a way to be away from others so that they can recharge and figure out why they are feeling so foggy. For the INFP it only becomes worse when they are forced to be around others and so they often need this time to be on their own. When the INFP experiences this brain fog they can become rather annoyed but they often recognize that they need to give themselves a break instead of trying to force things. ENFPs definitely become annoyed when they experience brain fog, especially since they are so caught up in their own thoughts. Feeling a lack of mental sharpness can become truly frustrating for the ENFP, but it causes them to become a bit on edge around others. They might want to retreat a bit and don’t like when people try to force them to communicate when they are feeling this way. The ENFP who experiences brain fog might want to be on their own, or even go experience something new without having to interact with others. They enjoy having things which can make them feel more connected to the world around them, especially when their brains are feeling a bit foggy. INTJs really don’t enjoy experiencing brain fog, since they are so focused on their inner minds and their mental sharpness. For the INTJ it is important to always remain focused and alert, and so if they do experience brain fog it can be very draining for them. They might try to push past this, hoping to overcome whatever is making them feel less sharp. INTJs are logical people though, so they will eventually try to assess what might be causing these feelings in order to actually solve the problem in front of them. They will look at what might be making them so foggy and find the best way to fix the issue so that it doesn’t become worse. ENTJs definitely become frustrated if they experience brain fog, especially since their mental sharpness and awareness is very important to them. For the ENTJ it is extremely exhausting when they feel foggy and incapable of being as efficient as usual. For the ENTJ anything that makes them feel less effective and less efficient is definitely going to leave them feeling anxious and frustrated with themselves. They will often try to find out what is causing the problem so that they can analyze and fix whatever is going wrong. INTPs are very focused on their inner minds and their mental wit, and so experiencing brain fog is deeply frustrating for them. Sometimes INTPs lack focus on their physical well-being and this is something which can cause them to experience brain fog. When the INTP feels like they aren’t as sharp as usually they can become a bit short-tempered since they want to be on their own even more. They prefer to be able to recharge without having people invading their space, and this is very important for the INTP. ENTPs really don’t like experiencing brain fog, especially since they value their mental sharpness very much. For the ENTP it can be rather draining when they feel like their mind isn’t as alert as it usually is, and this can cause them to feel a bit on edge. Their minds are so important for the ENTP, and so any sort of fogginess is very upsetting. They will do their best to approach the situation logically and figure out why they are feeling this way. They want to problem solve, and so they will analyze in hopes of uncovering what is wrong. ISTJs are very focused people who value efficiency and so when they experience brain fog it can be very stressful for them. They work hard to get things done and having anything which holds them back is going to leave them feeling anxious and annoyed. The ISTJ will want to figure out what is going on, so that they can solve the issue and move forward. For them brain fog is definitely a deeply frustrating thing to endure, since they care very much about being able to use their minds and be mentally sharp. ESTJs are focused on efficiency and when they aren’t mentally sharp this can become more challenging. When they experience brain fog it is definitely frustrating for the ESTJ and they will way to fix this. They might just try to power through their mental fog, and hope that they can just push past whatever is holding them back. For the ESTJ not being able to perform like they usually do is definitely going to leave them feeling anxious and uneasy. When the ISFJ experiences brain fog they will try hard to figure out what is going on, since they don’t want to let others down. They care about being there for their loved ones and want to be able to live up to their expectations. They push themselves to overcome these struggles and don’t want to do anything which might lead to failing or disappointing others. For the ISFJ brain frog is definitely frustrating and they will often try their best to push past this and just keeping moving forward even if they are feeling mentally exhausted. ESFJs are hardworking people who focus on taking care of their loved ones, and they often have rather high expectations for themselves. When the ESFJ feels mentally foggy it really leaves them feeling like they are failing or falling behind. They will likely push themselves to improve and try really hard to overcome the mental fog they are experiencing. While ESFJs don’t want to let others down, this feeling often comes from pushing too hard already and so what they really need is to take a break. ISTPs really don’t like feeling a mental fog but they often recognize when they need to take a break or time for themselves. When the ISTP feels mentally exhausted they take this as a sign that they need to take a step back. They don’t want to feel pressured to keep moving even when they are feeling foggy, and instead want to take a break for themselves. They do realize that sometimes they need to problem solve and see where the fog is coming from, but they don’t want to beat themselves up about it. ESTPs don’t like feeling a mental fog but they often realize this means they need to take a break. ESTPs are capable of letting go when they are feeling overwhelmed and will try their best to search for a way to recharge. There are some situations when they do try to push past their mental fog, especially for things which are important to them. They really want to be able to overcome these struggles, but at the same time they don’t want to push themselves when relaxation is requires. ISFPs live in the present moment and try their best to let go when they are feeling drained. When the ISFP feels a mental fog they often realize that they need to retreat for a while. They take a step back and try to relax so that they can really recharge from whatever is leaving them feeling so foggy and drained. ISFPs know how to give themselves a break when they need it and don’t want to become obsessed over performing a certain way for the sake of others. ESFPs realize that when they are feeling a mental fog they really need to be able to take a break for a while. When they are feeling drained and overwhelmed the ESFP wants to seek out things which will fulfill them and leave them feeling more energized. They aren’t interested in pushing themselves past their breaking point, especially when they are feeling completely overwhelmed and unhappy with their situation.